Easy-Garden Climbing Plant Trellis enables space to be used more efficiently by growing vertically. Constructed of Zinc plated poles and a strong and durable UV stabilized thermoplastic net for climbing plants. Net may be purchased seperately. Provides a base for climbing plants to cling to while growing. Helps produce more quality produce because fruit is not laying on ground. Promotes faster ripening by providing more light and air to plant and produce. 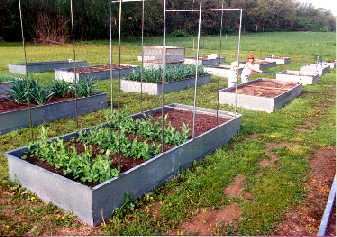 Brachets included for attaching to the Easy-Garden Basic raised bed and extensions or a wooden raised bed. (Screws not included for wood attachment). The growing trellis is an option to help climbing plants. It is constructed of poly deer fencing and all metal parts are zinc plated for long life. Shown on a 10 ft. bed.